I've held off giving chocolate to Isla. I've been afraid of the sugar and caffeine rushes that might ensue. 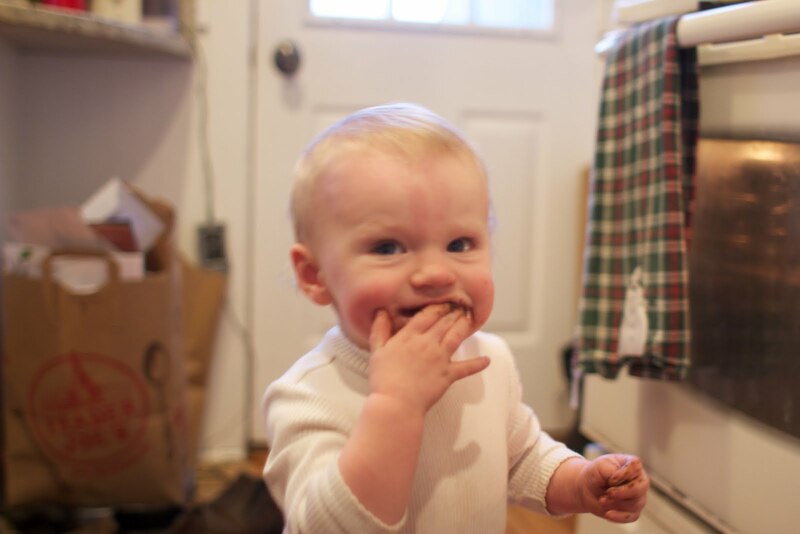 However, it started to feel mean to eat cookies in front of Isla without letting her have any. I am so happy I gave in, because the mess that followed was glorious. Her right hand is hiding the chocolate all over its palm as well as the mess around her mouth. 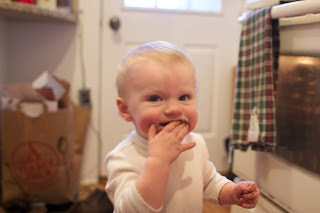 After finishing with the cookie, she spent minutes sucking the crumbs and melted chocolate from between her fingers. In other news, this little bundle of cuteness has become a real person. She walks everywhere and she has a bunch of words. My favorites are "uh-oh" when she has dropped something and "all done" (pronounced ahh-da). She quickly picked up the word "that" and emphatically points at whatever she wants while chanting "that".